The good news is we’re in Minnesota, where the healthcare is extraordinary and the kids are covered by MN Care. Max has been listless and lethargic since returning from up north, and I’d pegged it up to teenage boy laziness. And I feel like a heel – a guilty, bad-mommy, heel. Of all folks I should have caught this – I had Lyme disease back in the early 90’s, and I remember the apathy, loss of energy and overall malaise that inhabited my being for over a year. In my case it took a while to diagnose, and took even longer to treat. In Max’s case, we’re exceptionally lucky to have a diagnosis less than a month after point of contact, and today he starts antibiotics for 3 weeks. We’ll monitor it, we’ll treat the patient, not the disease (as his doctor says), and I have some making up to do after telling Max that I thought he was “faking it” this weekend when he said he was too tired to help me tear apart our rubbermaid shed and rebuild it. Bad, bad mommy. The hurt look on his face at my accusation will be one of those memories I will long carry. So all in all we’re lucky – Lyme disease is better understood than ever, this has been caught early and our doctor is absolutely on top of it. But that doesn’t change the fact that Max has a persistent, debilitating disease and he feels pretty crummy right now. Lyme has haunted me for years (my unproven ‘gut feeling’ is that it’s at the root of my fibromyalgia) and I’m hoping this won’t be the case for Max. It explains his less-than-stellar performance at baseball last week, though, and once again I’m guilty for giving him a, “C’mon, at least ACT like you’re interested in the game…” pep-talk/chewing-out as we biked home. 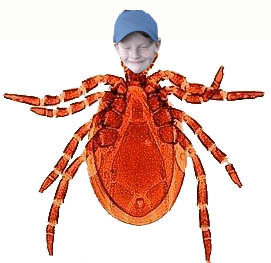 This entry was posted in Health and tagged lyme disease by Annie. Bookmark the permalink. My son Nick had Lyme disease, and like you, when he complained of being tired and aching, I just thought it was “lazy teenaged boy syndrome”… I still feel bad about it! Not a bad mommy – children of all ages do use the “I’m too tired” as an excuse and it is very hard to differentiate between sickness and malingering. You got him help in the end and not too late. Will you feel crummy for awhile, yes, but he will forget it first. We all have times when we didn’t take our children’s health as seriously as we should/could….I know because I waited 24 hours to take my son to the doctors when he was a year old – he had broken all the bones in one wrist falling while learning to walk – he had stopped crying very quickly and I thought he had just “bounced” like they do but….. I hope your son recovers quickly and that there are no lingering effects – remember not a bad mommy. I’m so sorry he’s sick. If it makes you feel any better, several years ago my daughter said her back was broken, but I didn’t think so. I sent her to church camp where they road bumper cars, among other things, and didn’t really think too much about it until I saw her turn green, really, as she went up to post and trot at her horseback riding lesson. Yep, she had a hairline fracture in one of her vertebrae. Talk about a bad mom. She forgave me, but it was harder to forgive myself. Aww, don’t get too down on yourself. I think it’s part of parenting to feel guilty about our mistakes. When I was a kid, my parents didn’t believe I’d broken a bone when I fell (I lost at King of the Hill) at a friend’s house. I’m sure they felt pretty guilty when they took me to the doctor three days later and found out I’d broken my collarbone. And yet, I did the same thing with my daughter when she slipped on the stairs at our home (when the babysitter was there) and we brushed it off for a few days, only to find out that she had broken her elbow. Sorry that Max is suffering, but I am sure you are suffering more. The guilt is bone deep but cut yourself some slack and go into loving mom mode. He will tell this story for years and tease you about it forever. I’m with you on the lyme’s triggering your fibromyalgia. Just cause we can’t prove it doesn’t mean it isn’t so. A few years ago, my sister was telling me that her 5-year-old daughter had been very rebellious lately–if she asked her to do something, her daughter ignored her, only obeying after my sister got frustrated and started yelling. A couple of weeks after our conversation, my sister found out that her daughter had suffered a serious and permanent hearing loss. She (AND her husband, who is an otorhinolaryngologist) felt very guilty about thinking Ava was just being rebellious. Anyway we live in an area with endemic Lyme disease, and know many people who have been infected, some long-term, in some cases with terrible consequences. Thank goodness Max’s infection was found so early!! Welcome to the “Guilty-Mommy” club. When my boy was a 5 yo I sent him to school with the flu. His school was an hour and a half from my job. Things even out when they become older teenagers, so don’t be too hard on yourself. The question is-is our fibro due to having had Lyme, or other tickborne disease, in the past? Or IS the fibro/CFS unrecognized chronic tick disease? The infectious disease doc I saw (who formerly practiced in the northeast, in the heart of tick disease country) suspect my chronic EBV titre is actually indication of tick disease, perhaps undiagnosable Lyme, perhaps something not yet named. I’ve been bitten dozens of times-I can’t see how I can NOT have contracted something that causes my multiple symptoms. Dont’ beat yourself up! It was over 10 years ago that you had it, and more often than not teenage boys really are just being lazy. One of my friends from work was also recently diagnosed with lyme disease, his was almost missed because he’d just had back surgery so his lethargy was attributed to post-op tiredness. Luckily, he saw the rash and went to his dermatologist who diagnosed it. I can remember as a kid, always seeing Public Service Announcement commercials to check for ticks, but now adays you don’t see them as much. I wonder if people are starting to forget? Don’t beat yourself – we all make mistakes. I’m not a parent (wish I were), but if I were, I’m sure I’d have moments where I was mistaken and owe my child an apology. It happens. No, you’re not a bad mom. Teenagers use “too tired” for anything they don’t want to do. My way to tell if the DS is really sick – send him to bed with no TV, no phone, no Playstation. If he stays in bed and falls asleep – he’s sick. There have been more than one “miraculous recovery” after about an hour of no fun. Forgot to add – I hope Max gets to feeling better soon! I hope Max feels better soon. Having a diagnosis when one is feeling crummy can be helpful just in itself. Plus, I bet those antiBs are doing their job bigtime. Don’t forget to feed him yogurt now and after he’s done with them.